Relocatable partitioning is 50mm, 75mm or 100mm thick and has a wide variety of panel configurations and finishes available. 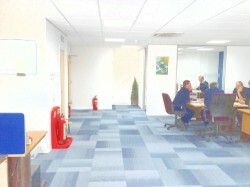 Being fully relocatable it can provide the flexibility to adapt to your working environment. It is a quality system adding stylish solutions to the planning of your interior space. 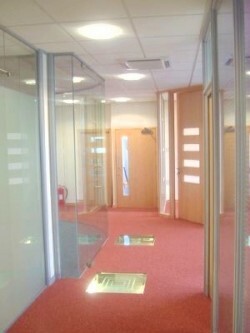 It is specially designed to accommodate fast track installations and can be non fire rated or up to 1 hour fire rated. Eye-catching designs can be achieved with elegant flush glazed window units. In addition to single glazed window units, double glazed windows are available with or without integral venetian blinds providing a high level of sound performance and greater privacy. 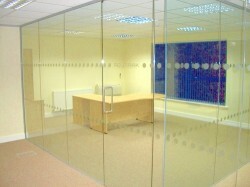 Full height and half height glass office partitions are available, both still maintaining a ½ hour and 1 hour fire resistance if required. 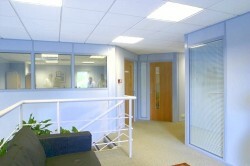 For more information on any of our office partition walls available, please contact us.